In a Nutshell: For the better part of 15 years, DocuSign has worked to help over 250,000 companies modernize their workflow by offering a secure platform for collecting electronic signatures on documents and agreements. Now, DocuSign is enabling its customers to go even further by digitizing the payments process through DocuSign Payments. 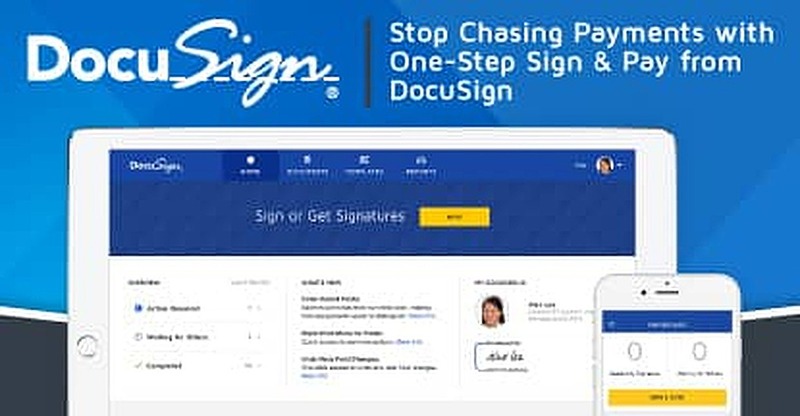 With the new embedded payments functionality, DocuSign users can electronically collect signatures and payments in one simple step — from any device — thanks to a partnership with Stripe that enables payments made by credit card, Apple Pay, or Android Pay. By integrating payments and signatures into a single platform, DocuSign Payments can help businesses save more than 10 hours a week previously spent chasing payments. When my old college friend decided he was going to start his own software company, many of our group (myself included) expressed concern. While he was simply bubbling over with enthusiasm and ideas, most of his planning involved designing a logo and laying out a website — not building a financially solid business. Six months into his new venture, the budding entrepreneur was sorely lacking his initial enthusiasm. Rather than regaling us all with the amazing things he would build, my friend was, instead, at his wit’s end. It turned out that, while his website looked great, he was woefully unprepared to handle the business part of his business. What’s more, it seemed that the new business owner had discovered a problem plaguing even seasoned enterprises: collecting payments. Despite his best intentions, my friend found himself having to spend hours chasing after slow payments instead of plying his trade. Indeed, at one point, the pacifist programmer actually confessed to experiencing the desire to throttle a particularly reluctant client. Unfortunately, my friend is hardly alone in his dilemma. According to DocuSign, an eSignature and digital transaction management company, 20% of businesses are forced to spend more than 10 hours a week attempting to collect payments. According to DocuSign, 20% of businesses spent more than 10 hours a week simply trying to get paid. In response to the needs of their customers, the team at DocuSign set out to eliminate the wasted time — and money — spent chasing slow-paying clients. The result was DocuSign Payments, an embeddable payments option in the company’s eSignature product that creates a one-step sign and pay solution. Whether working with a lease agreement, security deposits, or traditional invoices, no business wants to spend its resources mailing documents and tracking checks. Integrating payments when DocuSigning agreements and approvals cuts the chase by allowing clients to digitally sign and pay, all at the same time. For those who already use DocuSign for eSignatures, setting up payments collection is quick and easy. And no, your clients won’t need any additional software to sign or pay. One of the keys to the platform’s ease of use is the company’s partnership with payments giant, Stripe. Rather than waste resources turning itself into a payments processor, DocuSign enlisted the help of the proven experts at Stripe to securely handle credit card and digital wallet payments. “Stripe is a clear leader in the payment platform space,” Woody explained. “Its ease of use and speed of implementation will allow DocuSign’s customers to be up and running with DocuSign Payments in no time.” Of course, the team at DocuSign realizes no single gateway will meet the needs of every customer, so they have plans to expand processing options as the product evolves. Since its initial inception, the team behind DocuSign Payments has been inspired by the needs of their business customers. At its heart, DocuSign Payments is a product made directly for the thousands of DocuSign customers who asked for a simpler payments solution. 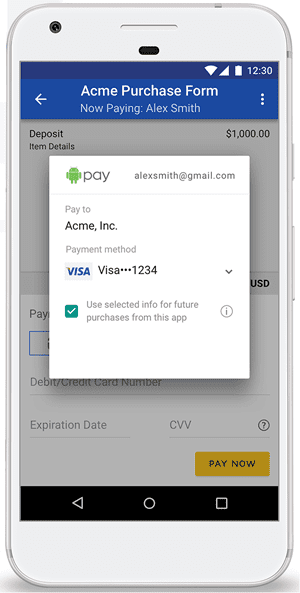 DocuSign Payments has a flexible mobile interface and fully supports Android Pay and Apple Pay. “We’ve worked closely with our partners and customers for years,” said Woody, “and launched a beta version with a select group of customers back in November.” In addition to rave reviews, the beta version of DocuSign Payments received a wealth of customer feedback, much of which was integrated into the publicly launched product. To allay any concerns about security, DocuSign Payments built a fully PCI-compliant platform. When customers wanted the ability to send, receive, sign, and pay from any device, the team created a flexible mobile interface capable of sending, receiving, and processing payments from any supported document on the go. Though my old college friend has steadily improved his business acumen since he dove into entrepreneurship, that first year was most definitely an advanced course from the School of Hard Knocks. Even today, with all his hard-won experience, he still has the occasional complaint of spending hours rustling past-due payments. Luckily, solutions like DocuSign Payments are there to save business owners like him from the time-drain of chasing payments.